Way back in January I sat down and put some thought into what I wanted to accomplish this year. Granted, it was cold, and I probably didn’t put as much thought into the goals as I should have. However, sometimes it is good to have something to focus on. It is way too easy to get distracted in life. So what were my goals? And, how am I doing on these goals? For the house I wanted to paint the garage, fix 4 windows, replace the bathroom floor and focus on cleaning up the yard. How did I do? The garage isn’t painted yet, though we have the paint and the front has been scraped and cleaned for painting, so I am confident that we will make progress on the garage. I haven’t yet gotten to the windows, but that could be a good fall job – we are now talking about purchasing some quality storm windows to replace the crappy storm windows (I know, I flop on what to do with the windows at least twice a year). I have replaced the part of the bathroom floor that needed to be repaired. Susanna still wants me to finish the other half of the floor; that could be a good job to do when the weather cools off. The yard, well that is another story. This summer was crazy and I didn’t get to spend as much time on it as I had hoped. There is always next year! Or maybe a weekend in the fall renting a brush clearing mower. In the workshop I wanted to finish the nightstands for the boys and build us a pair of nightstands. I also wanted to build a bed, fix the workshop floor and repair the doors. I had also hoped to add better heat for next winter. How am I doing? I finished the nightstands for the boys. The rest still haven’t been done. But I think the floors are on the short list after I finish my current project. Not too sure about building two more nightstands for our bedroom. Maybe if I have better heat I can get more done in the winter. However, I haven’t been a total slacker in the workshop; I am working on building three outside toy boxes for Susanna’s preschool. The first box should go out the door next week. With the family I had hoped to take the sailboat out for an overnight trip, go camping, buy a new car and print books from the boys’ blogs. How did I do. So far I have done pretty much all of this list. 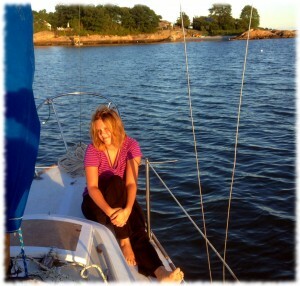 I took the boat out to Block Island for an overnight trip and Susanna and I camped in the boat this weekend. The only thing that I had hoped to do was take the boys camping as well. There is always next weekend (and the fall). We got a new car and I printed both books from the boys’ blogs. My personal goals included more exercise and continue to write. I did better exercising this summer over last summer, but still not as much as I want. I did keep writing in the blog, even if the last two months haven’t had much writing in them. The summer got very busy at home and at work, and it was hard to find peace long enough to focus on writing. I definitely think writing helps me reflect on what I have done as well as focus on what I want to keep doing. Both are good for someone with ADHD. This summer hasn’t been perfect. I started at least one big project that I gave up on (the wooden dinghy). 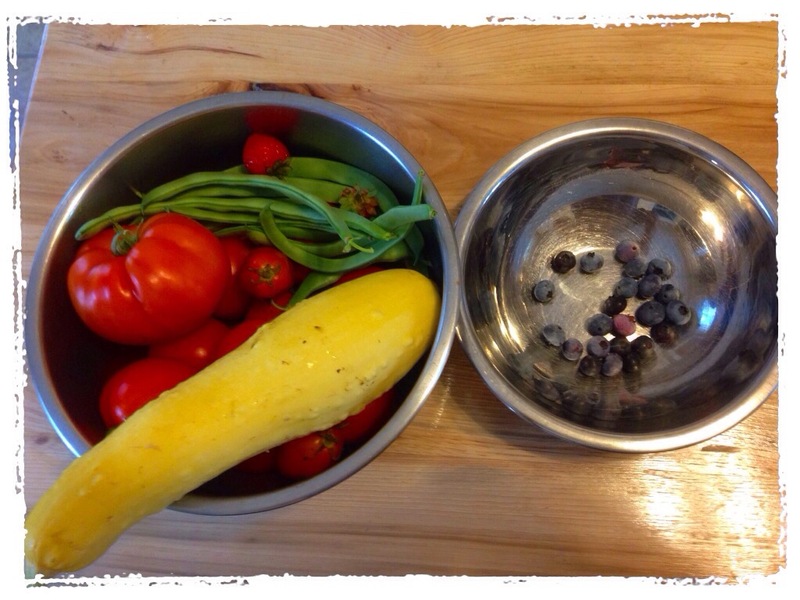 I felt that I had too much going on, so next summer I think it would be better to take things a little easier so I can enjoy more (maybe no garden next summer). It certainly helped to eventually find a way to bring the dogs with us on the boat – that reduces the stress of leaving the dogs home on the weekend after they have been stuck in the pen all week while we work. Adding air-conditioning to the workshop was a big help during the (very short) hot portion of the summer – which makes me believe that better heat (and insulation) would be really nice for the (probably very long) cold part of the winter. The early morning light over Giants Neck beach and our anchorage. You can see our boat on the horizon. After work on Friday, Susanna, the dogs, and I headed down to the sailboat for a short overnight trip. We again loaded up gear and headed south down the Niantic River. We passed under the Amtrak bridge and raised the mainsail. 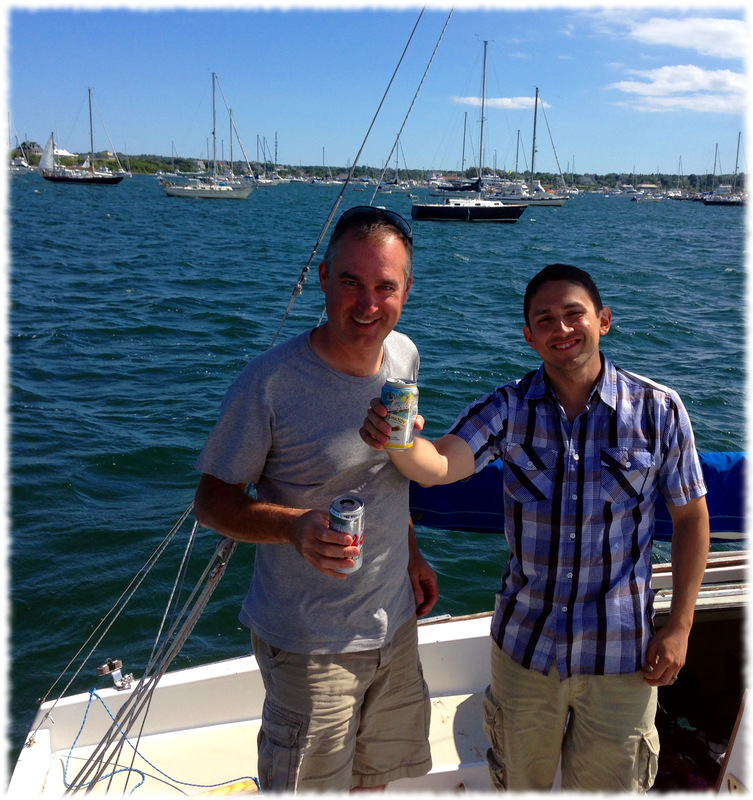 We motor-sailed across the Niantic Bay and rounded Black Point and headed into the anchorage around Giants Neck Beach. We dropped anchor around dinner time in about 3-feet of water. Susanna enjoying the evening light at anchor. I rowed the dogs over to one of the many rock islands that inhabit the region and let them wander a bit and go to the bathroom. Susanna pulled out sushi and some red wine for dinner. 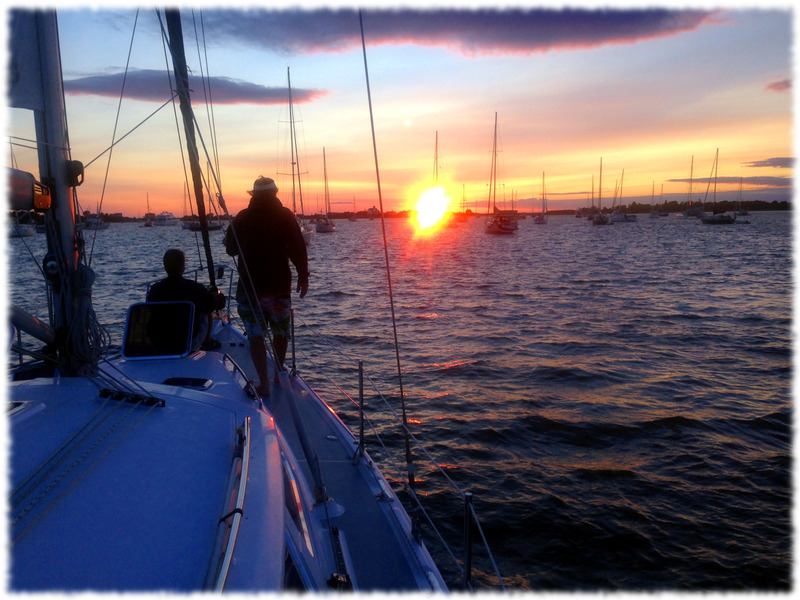 We sat at anchor and watched the sun set over East Lyme. The swell picked up around 2 am, waking both of us and making it difficult to get back to sleep. Anyway, I think the v-berth bounces around a bit more than the rest of the boat. However a while later the sea calmed down and we both drifted back to sleep. 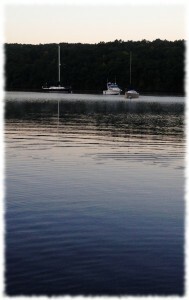 I was up with the sun, again taking the dogs ashore and then making coffee for the drive back to Niantic. We were back on our mooring by 9 am and home 30 minutes later. The goal for the night was to get some time away from the house together as well as see if we enjoyed camping on the sailboat. I think the trip was a success in both areas. Hopefully next time we won’t have commitments early the next day and I will be able to sleep in a bit. Targa and Tucker enjoying the early morning sun as we motor towards home while Susanna sleeps below. Today we took the final sail of the summer break. 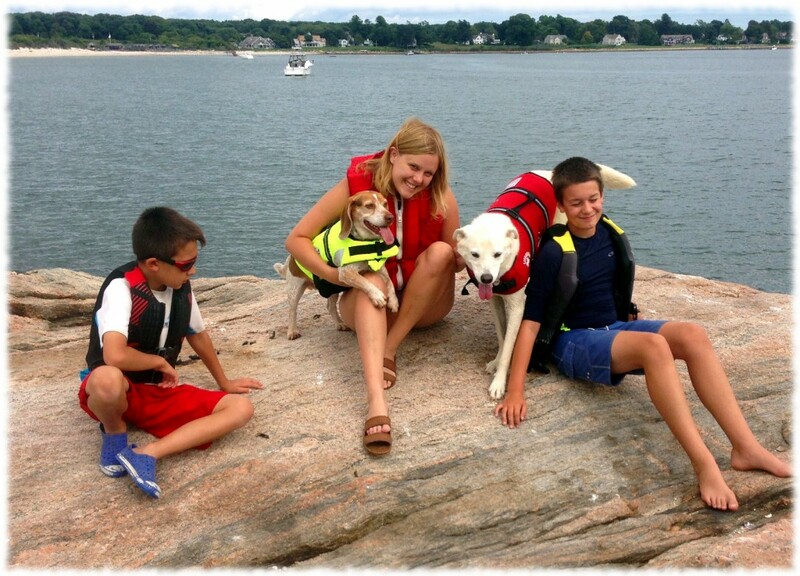 Susanna, the boys, and I loaded the dogs up and headed down the Niantic River and out to the sound. 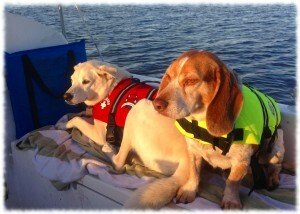 It was the first time that we have taken the dogs sailing, and they did better than I expected. Targa spent most of the time in the cockpit either sleeping or just watching. Tucker preferred to be below. 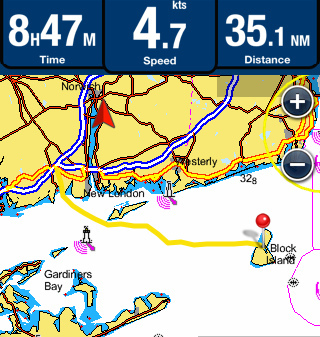 We headed out into Niantic Bay and took a right around Black Point and back up to Long Ledge and Griswold Island. 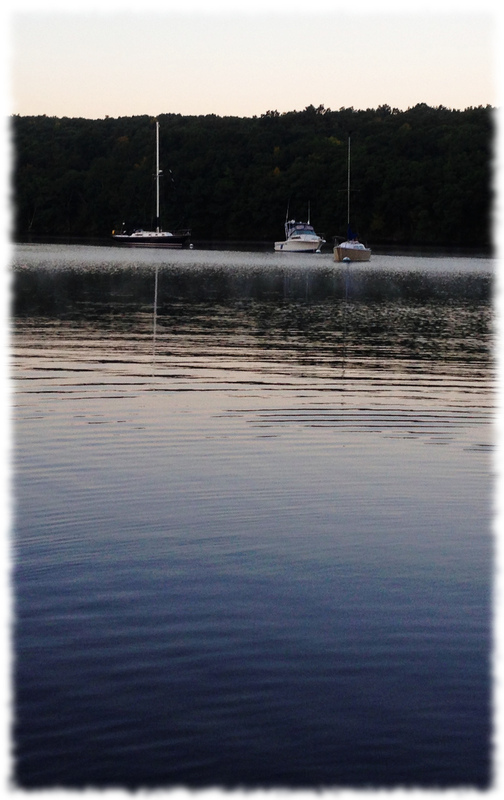 We dropped anchor in about 15 feet of water and used the dinghy to row everyone (including the dogs) to Long Ledge. 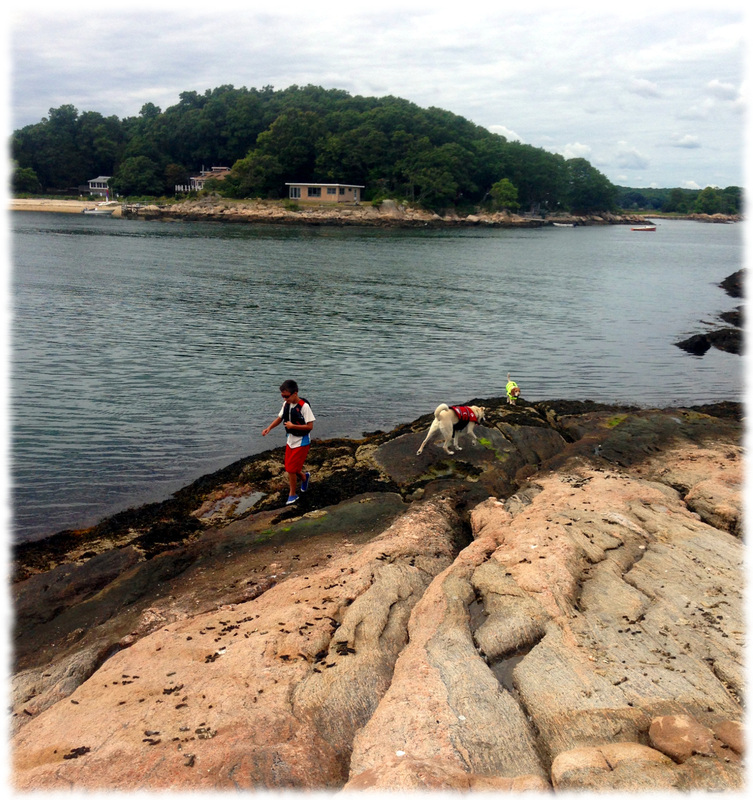 We all spent time exploring the rocks and swimming (the dogs needed a little “extra” encouragement to get in the water. After a short swim (it wasn’t the warmest day) we rowed back to the boat and headed home. We were off the water just in time to catch a not-so-healthy dinner at McDonald’s on the way home. Susanna, the boys, and the dogs enjoying Long Ledge. All are trying to avoid sitting in the bird poop (except the dogs – they didn’t seem to care). 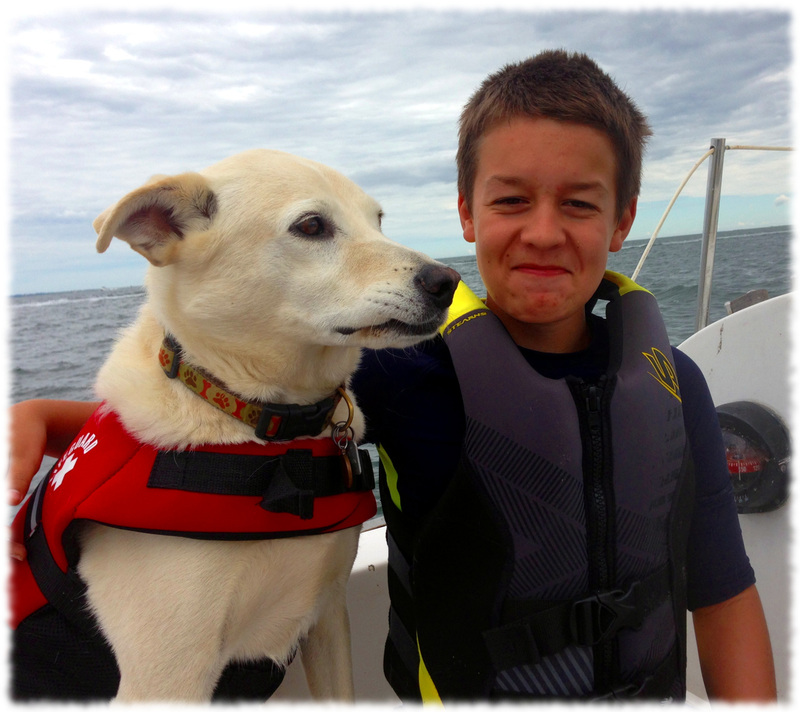 Ben and Tucker in the cabin of the O’Day 22. Will and Targa enjoying our motor-sailing around Black Point. My dad, my brother, and three nephews visited this past week. All five of them stayed with us for the week. It was much too busy of a week to write all about it on a tired Sunday morning. Instead, I’ll upload pictures. On Sunday, we stopped by Cows and Cones in Ledyard for Ice Cream. 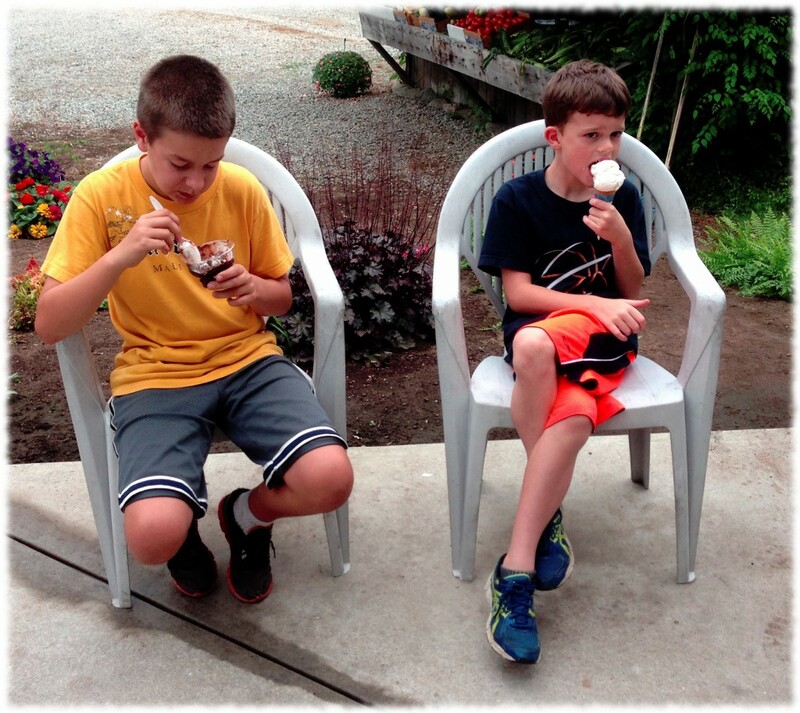 Here is Will and his cousin, Brady, eating their ice cream. On Monday, we headed into Boston. 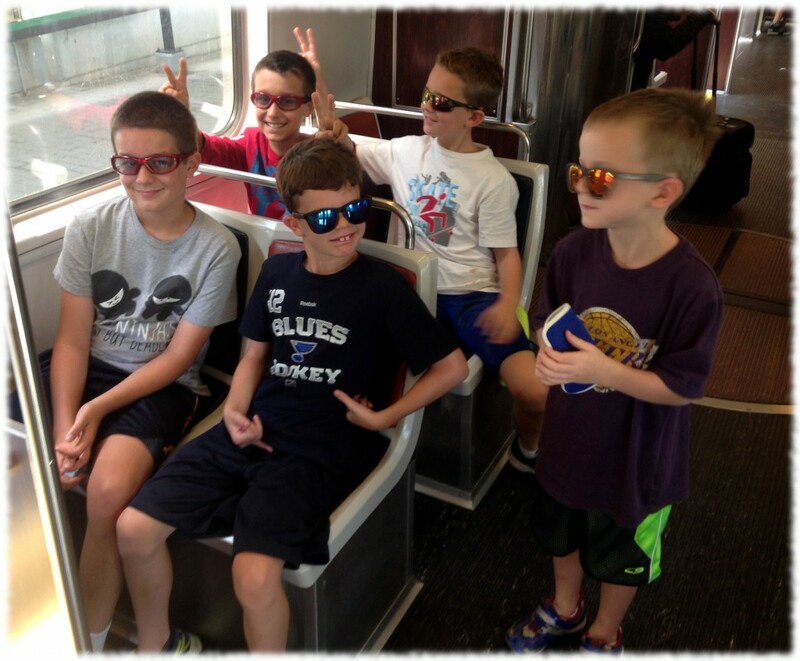 Here is a picture of the boys on the “T” (MBTA) heading into the city. 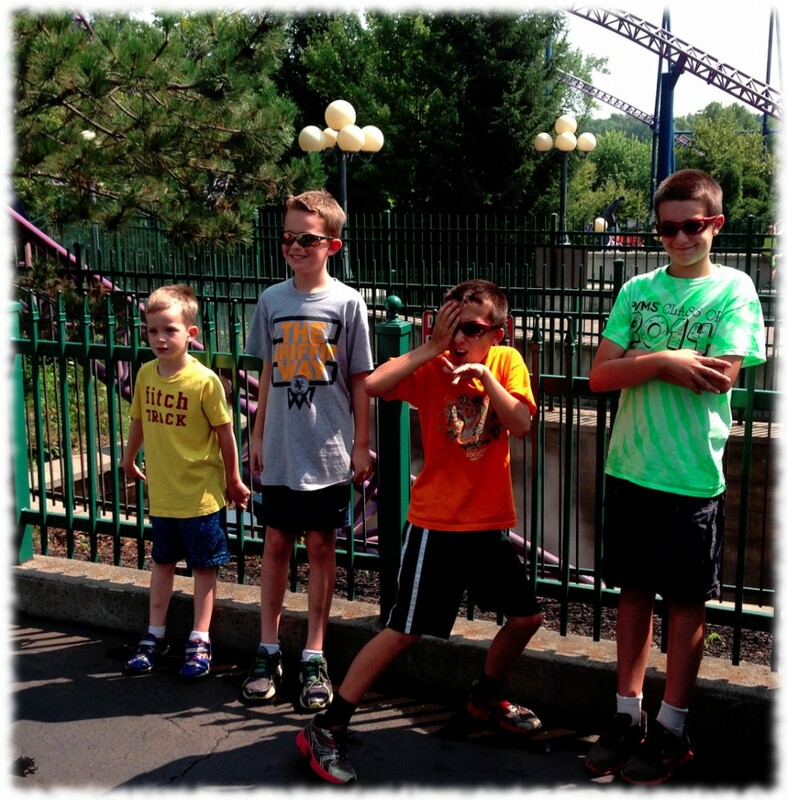 On Tuesday, we headed north to Six Flags New England. Brady doesn’t like rides, so he stayed home with my dad. 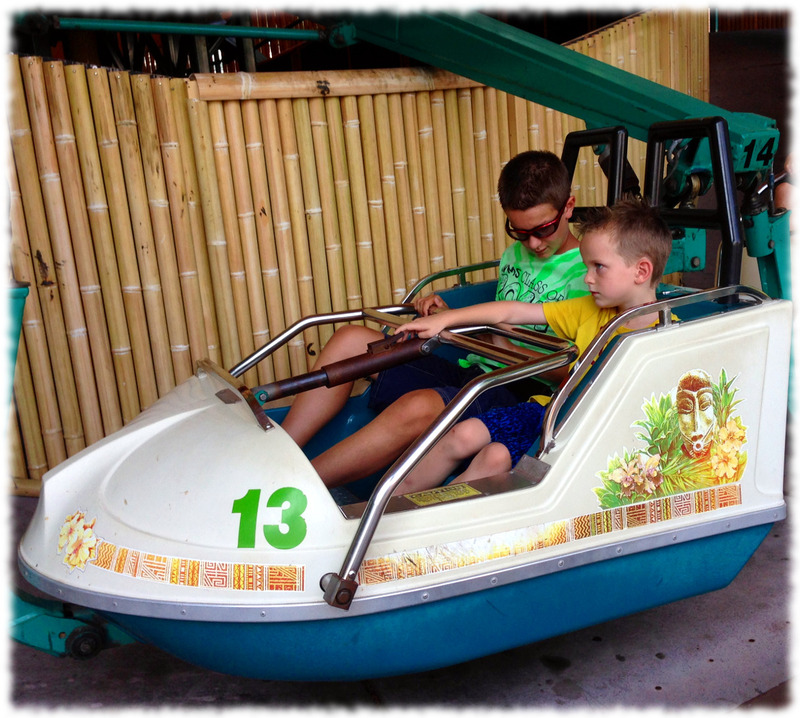 Will and his cousin, Chase, on one of the smaller rides at Six Flags. 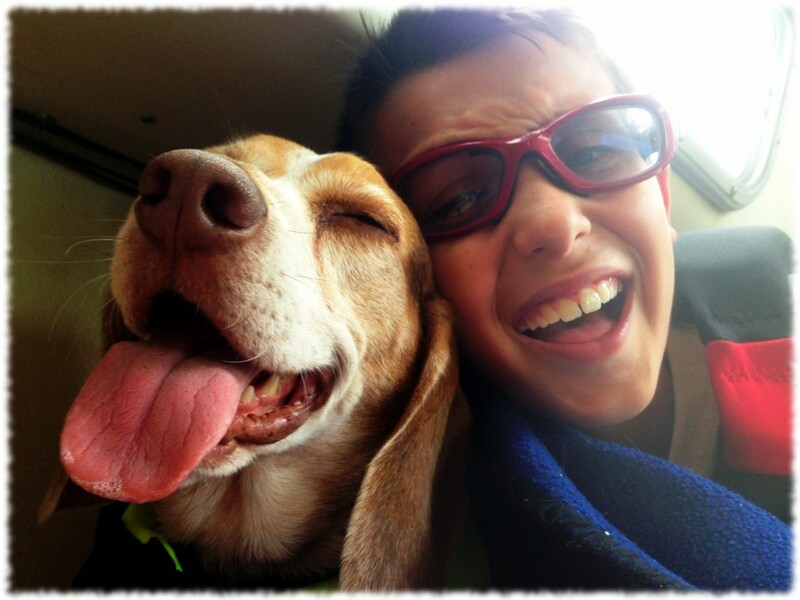 Will became Chase’s “best buddy” over the past week. 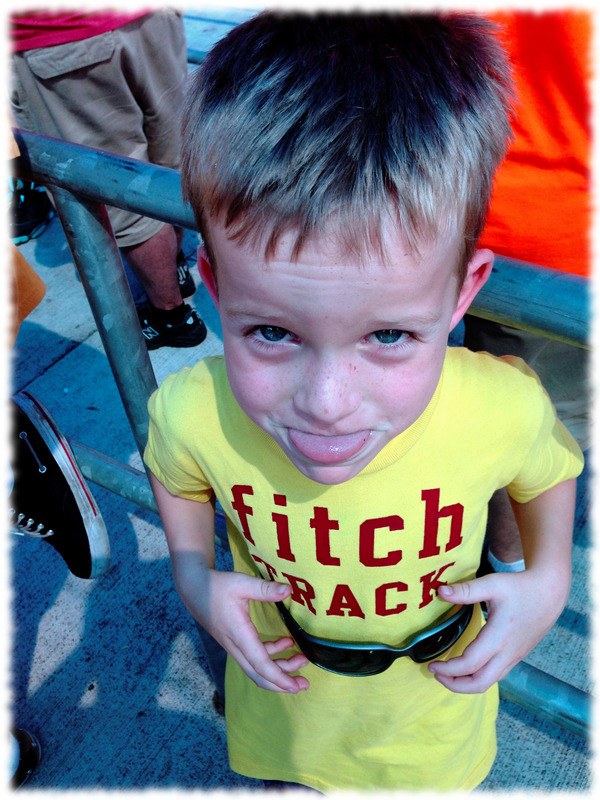 Chase in line with me for a ride at Six Flags. Looking sharp for the camera! Wednesday was a quiet day. We took a trip in the afternoon to the Book Barn in Niantic to get some reading material for the boys. 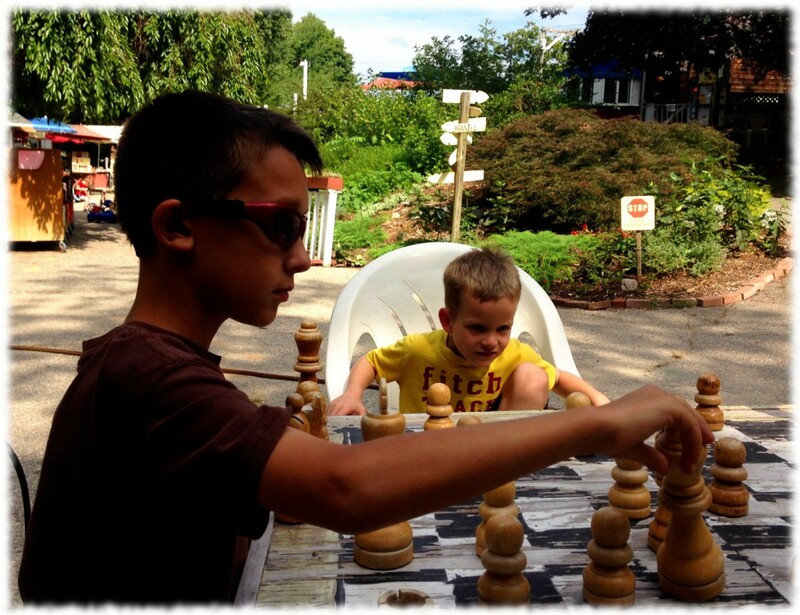 Here is Chase watching Ben play chess against Brady. Thursday took us to Bluff Point Park and Fort Griswold Park during the day. 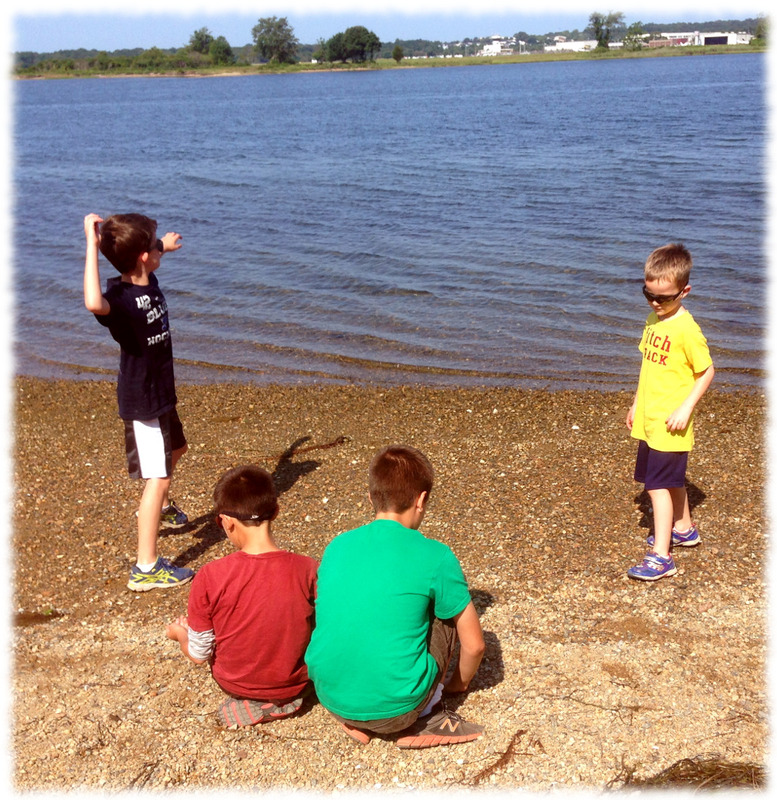 Here the boys are enjoying the water at Bluff Point. Thursday evening we headed over to my Uncle Jim and Aunt Rhonda’s house for a some dinner and pool time. 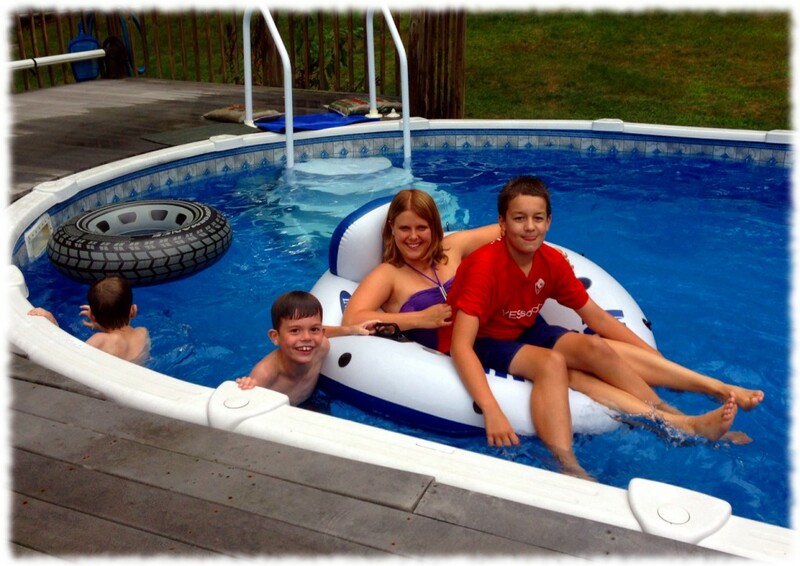 Here are Will, Brady and Chase swimming with Susanna. Friday and Saturday we headed to New York City. 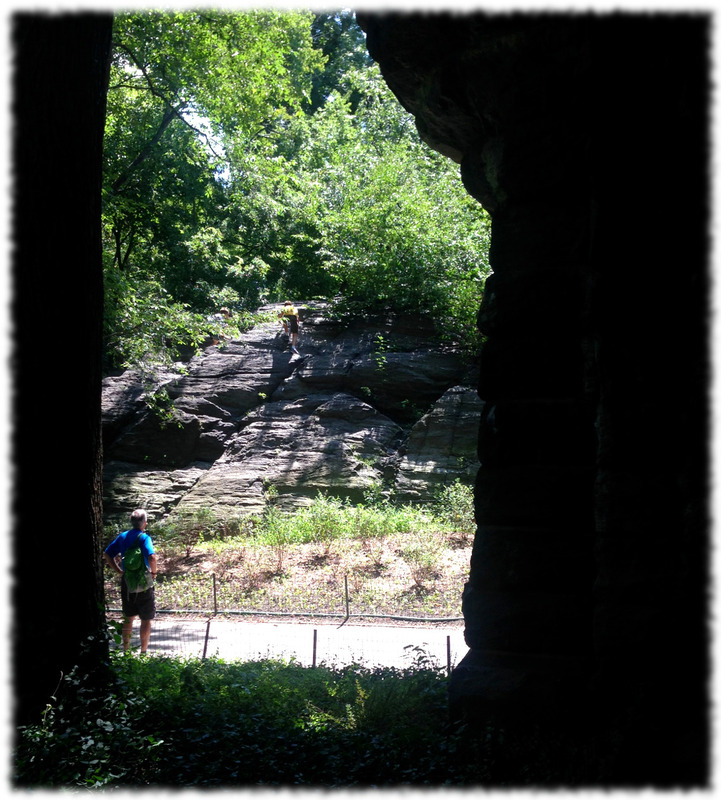 We spent most of Saturday exploring Central Park. Here is my dad watching the boys climb rocks at the park. Thanks to Will, Ben and Brady for helping.